The 8 quart capacity: This large size cooker can accommodate a meal for 8-10 people. Variety of functions: The pressure cooker can also be used as a warmer, slow cooker, steamer, sauté pot and browner. Safety: The product received an ETL stamp for meeting industry standards for safety and uses a stainless steel cooking pot. The GoWISE GW22606 has received the ETL approved stamp of approval. ETL is the industry standard on product safety. The inner pot of the GoWISE Cooking Pot is made of stainless steel. Many pressure cookers use a Teflon, no-stick, cooking pot. Since Teflon products are being phased out of production because of health concerns, it is reassuring to know the cooking surface of the GoWISE USA cooking pot is made of stainless steel and that replacement stainless steel cooking pots are also available. It is usually priced around $115 (see lowest price). The housing of the GoWISE GW22606 cooking pot is also made of stainless steel and is easy to keep clean. The cooker even features a removable lid liner. A large handle across the top of the lid makes it easy to lift. The 8-quart capacity of this cooking pot can make meals to feed 8-10 people. Command central is located on the front of the pot. The panel includes a LED pressure gauge display as well as a timer. Also located on this control panel are one-step settings for cooking brown rice, white rice, meat/stew, vegetables, beans and soup . Pre-set times can be manually adjusted for more or less time. ​If you want to simplify your life, the multiple functions of the GoWISE stainless electric pressure cooker, can help. The steel rack that comes with the GoWISE GW22606, allows you mufti-task. You can separate food when you cook. For example, you can cook rice at the base of the inner pot and warm dumplings on the wire rack that comes with the cooker. You can do the same with meat and vegetables. ​One recurring complaint with GoWISE GW22606 is the lack of a comprehensive instruction manual. ​Fortunately, the product is pretty intuitive to use. There is an owner’s manual available on line. The Go Wise USA Company seems responsive to customer concerns when there are problems. ​In just one appliance you have a pressure cooker, sauté pot, warmer, slow cooker, steamer and browner. ​One pot cooking means one pot clean-up! Cooking in the cooking pot is less work and less stress. A convenient feature of the cooking pot lets you delay start. This means while you are at work, the cooking pot can turn on, start dinner, and have the meal cooked and waiting for you when you come home. ​The GoWISE GW22606 is an excellent one-pot device for makes soups and boiled dinners, but is also an easy way to make porridge, rice pudding, tapioca, even yogurt. The cooker tenderizes less expensive cuts of meat and also seals in flavor and nutrients. ​​I am a person who likes to follow directions and get to know the item I purchased. That did not happen with this pressure cooker. This was my first electric pressure cooker. I had no idea how to make the thing work. I was very frustrated and almost sent it back. I did call the company and talked to a very nice person who actually talked me through my first dinner. She also sent me an instruction book that is very minimal, but better than nothing. The thing is-- the product is very good. I decided to keep it. If you’re in the same place I was two months ago, in an endless rush, really striving for that healthy lifestyle but you never seem able to fully follow through with the plan you set out, then purchase the GoWISE GW22606 and don’t look back. There’s only one pot to clean and the food is always kept warm and ready for you when you come home, what more could you ask for? Stainless steel cooking pot and aluminum removable plate included for easy removal of the sealing gasket and lid. Delay cooking time up to 12 hours; manual setting up to 99 minutes of cook time. If I had a large family, this is a product that would be ideal. It is easy to use, has a wide variety of functions. It is safe and affordable. Most difficult PC to figure out! Lost my instructions! You would think it would be easy, NOT!!!! Yikes, that stinks. Have you check with GoWise to see if you can get another copy? Go to the site or even Amazon, pull down instructions, & print. Seriously, I plugged it in, and used it to cook my easter ham without reading anything, easy. Took the ham to my sisters, in the cooker, with no worries of it spilling all over my truck like it usually does. Got to my sisters, removed my perfectly cooked fall apart ham, hit the saute button and made gravy right in the same pot. There are many videos on you tube on how to use a pressure cooker. It is as easy as they make it seem. My parents (really my mother) bought this for me and my frat brothers when we got our own house. And man…it is the best. At the end of the day of school and/or work…to come home and smell the food already cooking. Nice. And it does provide enough for me and 4 others. Good deal. Nice! Thanks for the comment Justin! In your “final comments” for the goWise 8qt pressure cooker, you say to buy the Instant Pot Duo. ?? They seem relatively the same to me, although I’ve read the goWise pressure fluctuates (does that really affect performance?). But I’m trying to decide between the two- which is your final recommendation? Thanks! Hi Tami – Sorry, that was a typo! I fixed the mistake. 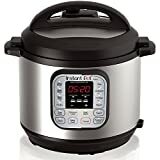 Although I do recommend the Instant Pot Duo as entry level pressure cooker. Thanks for this, Elizabeth! Quick question: Instant Pot uses 18/8 stainless steel for the inner pot, and GoWise uses 18/12 (I emailed to ask and that’s what they replied). There is a lot of information online about 18/8 and 18/10, but virtually nothing about 18/12. I’m thinking it might have something to do with the amount of nickel and molybdenum, but don’t really know. Curious to know if it falls into the 304 grade like 18/8…or if it’s better or worse than 18/8. Trying to decide between the 8 qt Instant Pot or GoWise. Agree with Alexandra-and I have the instructions-which are useless. Have two IP’s and this one (GoWise) is now sitting in the garage. Having problems setting the pressure valve. Heat keeps on escaping leaving the inner pot empty. Thank goodness I’m testing with 2 cups of water. Someone please help-their web site is not help doesn’t address the problem in faqs. I really like the pressure cooker however I wish it came with a cookbook. I have use the crock pot more than the pressure cooker. I purchased one of the Go Wise Pressure Cookers and have never used one before. It came with an extremely limited instruction manual so I went online to …get the same one, only instructions available. I followed the instructions and I keep getting an “E4” message and the thing won’t work! I am interested in the 14 qt GoWise Pressure Cooker but I need more info on the ceramic coated pot. I would much rather have a stainless pot but the bigger ones do not have it. Anyone with insight? I can’t find their website or who to ask. I just bought the 12 quart to cook my Easter Ham. I wanted a 10 Qt but could not fine one that was stainless steal and not Teflon. The ceramic coating, the new non stick to replace teflon, is awesome. I made a ham using pineapple, rum and brown sugar, made the gravy in the same pot, and it almost wiped clean. If you make large batches of stew, chili, ribs, whole hams, the size is perfect. Not sure how much bigger the 14QT is. I can not see making a pot of chili in a 6qt, but then I never learned how to cook “small” I like to make large batches and freeze single portions. I am thinking of getting the 6qt to make small size meals. If you use a slow cooker to take to parties, you can do everything you do in a slow cooker, in the pressure cooker, and it will cook faster and you can keep it on warm to serve from it. Just remember not to use metal utensils. Hope this helps, I am very satisfied with my choice. I found a 10 qt XL in the store, the 12 Qt is not that much bigger, and it was $50 cheaper. For the people that need directions just go to you tube and search for the GoWise USA, there are numerous demonstrations. Just opened my 14 quart GoWise. It’s my 2nd pressure cooker. But what the deal with the inner ceramic-coated pot not being dishwasher safe? Do I have that right? Also, I envisioned myself making mass quantities of chili, but I’m limited to 60% of the pot’s capacity? Just think of the small amount of chili you can make in the 6qt one. It is still a lot of chili when you think about it. I usually use my stock pot and my 12 qt at 60% is about the same size. Does the pressure cooker have two gaskets or one? Lid hard to put on and now it want come off?? Hi, joejones! Without knowing which model you’re struggling with, it’s hard for me to give you specific advice on how to get the lid off … but I can say that the few times I’ve had trouble getting a lid on or off, it usually comes down to something “oops” like I didn’t have the rubber seal situated correctly (or for the Power Pressure Cooker XL, I had the lid’s inner metal disk flipped around the wrong way — sometimes, I really wonder about myself!). The good thing I’ve found with the various models is that there’s no way that the lid will be forever stuck (LOL) — with some jiggling, the lid will come off. And as a wonderful safety feature, the pressure cooker will not operate if the lid isn’t seated on correctly.